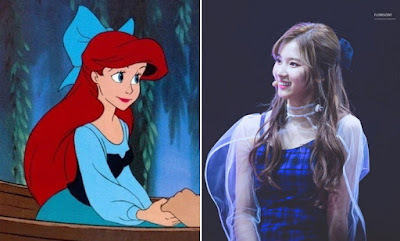 She's exploding with her 'Princess' vibes when she has ribbon as accessories and also when she has half of her hair tied. -How is it possible for someone to have a face that small.. And she looks gorgeous in that comparison picture with Aurora..
-Whoa.. She really does look like a princess in that gif from MAMA..
-Sana keeps on getting prettier as the time goes by..
-She really does look like a princess from Disney.. My princess!! -I was blinded by Sana during their Likey comeback performance in MCountdown.. I even watched her fancam for over than 20 times because of how pretty she looks there..
-Sana.. I'm not her fan but I have to admit that I'm also mesmerized by her beauty..